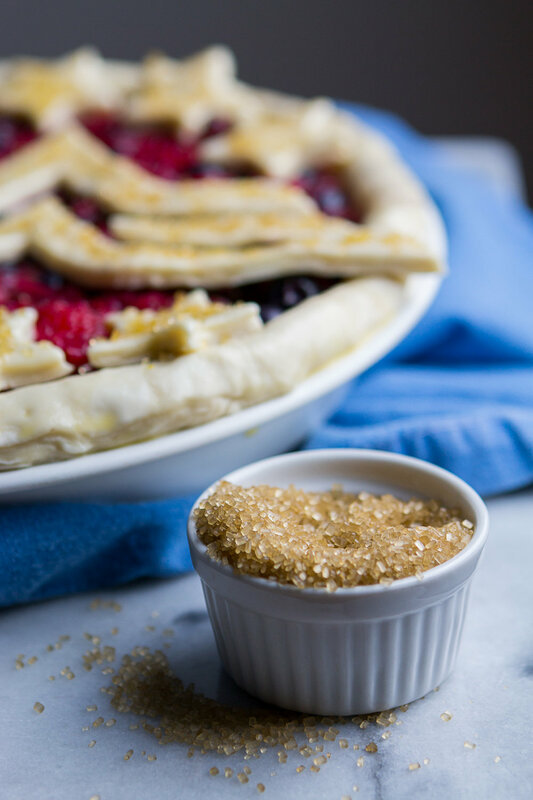 Cranberry, Raspberry and Blueberry Wonder Woman Pie — knead. bake. cook. When my boss' birthday was coming up last week, it was without any hesitation that my office decided on a Wonder Woman theme. Nicole has Wonder Woman dolls on her desk, her phone case is Wonder Woman themed, as is her phone wallpaper and her ringtone. And let's not forget her golden Wonder Woman earrings. I just knew that when she saw this pie, she would be so freaking excited. Luckily, she was a lot more than just freaking excited but ecstatic and overjoyed. Nicole always has the best level of enthusiasm for the everything. The filling for this pie is something that I really chose because I wanted to use up a huge bag of cranberries in the freezer. But it was perfect because with the raspberries, blueberries and addition of demerara sugar on top of the crust, voila, I coincidentally was able to have all of the Wonder Woman colors. This recipe is adapted from this pie from Bon Appétit. I liked how in the description, it was described as so—"This pie is seasonless: Bake it in fall with fresh cranberries and frozen raspberries and blueberries. Come summer, use the reverse." Win-win in my book. Pie should be eaten all year 'round. As for the logo, look for the Wonder Woman logo on the interwebs, print it out so the width is no more than 10 inches wide, put on your favorite music, show or movie or even better the newest Wonder Woman movie and spend some time cutting out those four pieces. When it comes to working with the top crust, I highly recommend chilling the crust in the freezer when it starts getting soft. This took me about two times to work through. Be patient. It's so worth it in the end. And of course, I added stars to represent the original Wonder Woman comic. Gal Gadot's rendition is awesome, but I think it's always important to nod towards the original. If you're not into Wonder Woman or are like "Really, Kara another tedious baked good? ", that's totally okay! I would use the complete top crust and maybe cut out some stars or cut some slashes instead. The bottom line is that there will be pie and that it will be delicious whether eaten in the heat of summer or the dead of winter. Also, don't throw away that leftover crust. Instead, make a leftover pie. Any fruit filling of your choice, and then top it with the rest of the rolled out crust. The crust can be prepped at least two days ahead or pulled from the freezer at least 12 hours before rolling it out. The top crust can also be prepped ahead. Cut out shapes and store in the freezer for up to two days prior. Freeze on a baking sheet and cover in plastic wrap to prevent freezer burn. Prepare double pie crust according to instructions. Allow dough to chill in the fridge at least 2 hours. Toss cranberries, blueberries, raspberries, and sugar in a large bowl to macerate. Let stand, tossing occasionally, until berries release their juices, 50–60 minutes. Once the crust has chilled, take one portion of pie crust and roll into a 14" round, about ⅛-inch thickness. Place in a pie pan and trim and tuck the edges. Place in the fridge to chill. With the other portion of pie crust, roll again into a 14" round, about ⅛-inch thickness. Place on a piece of parchment paper or non-stick baking mat on top of a large baking sheet. Chill in the freezer until ready to cut. Once berries have released their juices, drain them in a fine-mesh sieve over a bowl, reserving liquid. Set berries aside. Transfer liquid to a blender, add lemon juice, cornstarch, salt, 3 tablespoons flour, and ¼ cup berries. Purée until smooth. Transfer to a small saucepan and cook over medium heat, whisking constantly, until thickened, about 5 minutes. Transfer purée to a large bowl, stir in lemon zest and reserved berries and toss to combine. Remove bottom crust in the pie pan from the fridge. Pour filling into crust and chill in fridge while you work on the top crust design. Meanwhile, pull your chilled and rolled top crust out of the freezer. Using your Wonder Woman logo cut-out and a sharp paring knife, carefully cut out the four individual pieces of the logo. As you continue to work, the dough will soften up. If you notice it is starting to pull as you run your knife around the logo, chill it again for 15 minutes at a time. Be patient, this is a process! Using a ~1½-inch star cookie cutter, cut out 10 stars as well. Place a rack in lower third of oven and preheat to 375°F. Once all pieces have been cut out, remove the chilling pie out of the fridge and reassemble the logo on top of fruit with 6 stars on the top edge and 4 stars on the bottom. Place in the freezer to chill for another 15 minutes. Brush the 10 stars, edge of the pie and Wonder Woman logo with egg wash and then top with the demerara/turbindino sugar. Place pie dish on a rimmed baking sheet and bake for 30 minutes. Reduce heat to 350°F, rotate pie, and continue baking, tenting with foil if crust is browning too quickly, until juices are bubbling and crust is golden brown, 45–60 minutes longer. Transfer to a wire rack and let cool at least 4 hours before slicing.